"There are a lot of things I want for my kids as their mom. I'm sure you other mamas can relate. I hear a story about a child who was seriously injured falling off a bunk bed - I have visions of my kids tumbling down stairs and emergency trips to the hospital. I want them to stay safe. So I redouble my efforts to baby-proof the house. I watch the news and see a story about a child that was kidnapped. I worry about my kids being around strangers when I'm not there to watch them. I want to protect them from the world and the evil that is in it. So I interview nursery workers and watch my kids like a hawk at the grocery store to make sure they don't wander off. I think all these desires for my children are good things, and all the things that we moms do for our kids to help them and give them the best start are things we should be doing. But isn't it all exhausting sometimes?" Go check out the rest of my guest post on Natalie's blog! How about a good old life update post? Seriously, between Gwen pulling up on everything and Wyatt potty training, these two are hard to keep up with! They are such sweethearts though, and both of them have such great personalities and senses of humor. They brighten up all my days. We started MOPS, and it's been good so far. I like my group pretty well, and I'm looking forward to trying to get to know the girls better. It's kind of weird to me to be starting over with a whole new group this year. Last year was my first year of MOPS, so I'm still getting used to the switch. Also, I discovered that our MOPS group has a blog! I know! I never even thought there might be a blog. I emailed our director and volunteered to help out with it, but there is already someone handling it this year. I am planning on applying for the spot next year though. I have so many ideas for the MOPS blog running through my head even now. I need to write them down so I can keep them fresh in my mind if I get a chance to help out next year. We gave potty training a brief try in February, then I decided I wasn't ready. And Wyatt probably is more ready now than he was then too, so I don't regret that. However, it's been slow going, and this is pretty much all my fault. I started potty training Wyatt again in July, but guys, we live an hour away from town. If we have to run errands or whatever, we are pretty much gone the whole day. I was scared about handling accidents on the go, so I would put him back in diapers for when we had to go somewhere. I think this pretty much just confused Wyatt and set him back a bit, and I feel awful about it. So a couple weeks ago I just said to myself "No more diapers", and it's been going so much better ever since. Wyatt is really starting to get it, and accidents are few and far between, so that's exciting! Derek has been traveling a lot for work. And it pretty much stinks. Nothing is right when he's gone - the dogs act up, the kids don't sleep, and I don't eat anything but canned soup. I'm handling it better than last time, but I'm still ready to be done with it. Not much else to say. I really want to start a bowling night. Why don't people bowl more? Bowling is fun. I was thinking to designate, say, the first Saturday of every month or something like that, as bowling night, and Derek and I will be at the bowling ally. And we will invite friends to come and join us every month. Kind of like our own little bowling league. Do people even like bowling? Do my people like bowling? I don't know. But I think it would be fun. Maybe nobody would come, but if nothing else I'm pretty sure I could count on my sister, and that would still be fun. The scheming is still in progress. And that's about it for now . . . hopefully more interesting stuff coming soon! Derek is finally mostly done building the porch, so we have our weekends back! Every fall and spring I feel like all I'm doing is shopping for more clothes for the kids. Sheesh, they grow fast! I found some cute things for them, so I thought I'd go ahead and show them off here. You know what stinks? I ordered a lot of these from Crazy 8 (all except the last three). It's my favorite place to shop for Wyatt, and I've never had any trouble getting things delivered to me before. But there was a mix-up with the post office, and they marked the package with "No Such Number" and sent it back! Aaah! That was two weeks ago. So now I have to wait for it to get back to Crazy 8, so they can send it back to me again. Apparently it can take up to 3 or 4 weeks for the clothes to get sent back. So I don't even have those clothes for him yet. In the meantime, I keep having to buy Wyatt more clothes because he has nothing to wear! The kid is growing out of things left and right. I'm beyond frustrated, and just praying that it gets back there without being lost, because it doesn't sound like Crazy 8 will even give me a refund unless they get the package back. I got the clothes on sale, but it wasn't that good of a sale - I can't afford to buy everything all over again. Moving on (before I start to get depressed about it again). . .
Good 'ole Target. You can get some good deals online, but there is nothing like the security of just leaving the store with your items. I bought everything there except the boots (Old Navy - waiting for them to get here), and the flowered jacket (which was part of the infamous Crazy 8 package. *sigh*). I'm looking for some yellow leggings or jeggings for Gwen, because I feel like they would go really well with everything else I got her this year. And they would be cute. No luck so far. I did order a pair of yellow pants for her from H&M, along with a sweater, but they were both huge! She's in all 12 month stuff in other brands, so I ordered 12-18 months. They were more the size of 2T stuff. I know because I measured them next to Wyatt's 2T pants and shirts, and they were the same size! I decided to just save them for next year, but it was kind of a bummer. It makes me kind of afraid to order from them again! I guess I know now that their kid clothes run big. If anyone knows of any good places to buy yellow baby girl pants, I'm all ears. I obviously don't need a whole new fall wardrobe, but I couldn't resist getting a couple things! The striped shirt is still coming in the mail (I shop so much more online after having two kids . . .), and I hope it fits because I've never ordered anything from H&M before (except that outfit for Gwen which was huge). The yellow pants are from Walmart, if you can believe it, and they're on sale for 8 bucks! I like that. I was in desperate need of shoes. Seriously, all my other flats are looking pretty ratty, so it was overdue. And I can't go wrong with Forever 21. I love shopping at F21 online because they list the measurements of pretty much every part of whatever garment they're selling, so I know exactly how it's going to fit me. I'm really into scarves this year, so I may add a couple more scarves and then I'll be set. Though I am considering the polka dot jean trend. I'll keep you posted. Poor Derek is left out of this because I never know what he needs, and he's super-picky. If he's not careful I'm going to make him go shopping with me. Where are your favorite places to shop for kids clothes. Or yourself for that matter? And am I the only one who shops mostly online after kids? After I had kids I became concerned with how to balance blogging with protecting my kids' privacy online, but particularly when it comes to pictures of my kids. I actually wrote a whole post about protecting blog images here, and I describe some of the ways I do that. However, one thing that kept bothering me was that I would get visits to my blog through pictures of my kids that showed up in Google Image searches. Not that anyone was searching for anything inappropriate, but it just made me uncomfortable to have pictures of them showing up in random searches. Because my kids are so cute, who wouldn't want to steal their pictures, right? 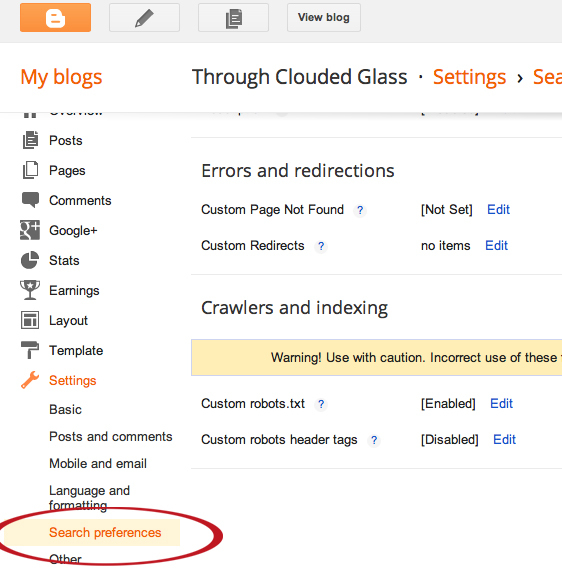 I actually disabled my blog with search engines for a while to try to keep that from happening. But after a while I felt the Lord was telling me to make it open to search engines again. So I did, but I still didn't like the picture thing. Then one day I decided there must be a way to tell Google not to index the images on my site, so I did some research - and lo and behold, I figured it out! All you have to do is edit your robot.txt file to tell Google not to index your images! Yeah, that deer-in-the-headlights look you probably have right now? That was my reaction too. But this is easier than it sounds. First of all, when should you do this, and when should you not? Good question. Here's what I think. 1. You are getting visits through pictures of your kids using keywords that are inappropriate. I think you should definitely consider it in that case. There are weird people out there. 2. You are uncomfortable with pictures of your kids showing up in searches. 3. If you may have kids in the future and don't like the thought of their pictures showing up in searches. 1. You get a significant amount of traffic that is helping your site from image searches. If you have ads on your blog, you need to be aware that preventing your blog images from being indexed will affect your traffic in some way. If that is a problem for you for whatever reason, don't do it. Okay, if you are still wanting to ask Google not to file your images, proceed. Take the following bit of code . . .
Then click the "edit" button next to the words Custom robot.txt, select "Enable", and then paste the code into the box. Don't forget to save your changes! And wolla! 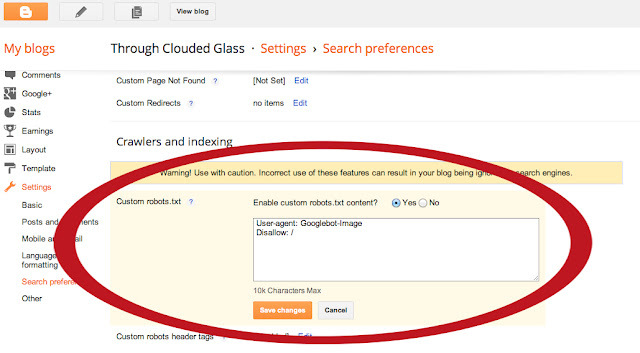 Your images won't show up in Google searches anymore! I would like to note that you shouldn't expect the images to disappear from Google overnight if you didn't have your blog set up this way from the start. It takes time for Google's little bots to come crawl your site and see the changes. Your privacy settings for your image hosting site can also affect this, but that is probably a different post. 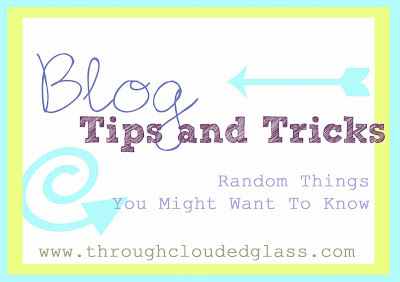 You should also be aware that any images that you post of your kiddos on other people's blogs, like for guest posts or linkups, may still show up in Google searches. 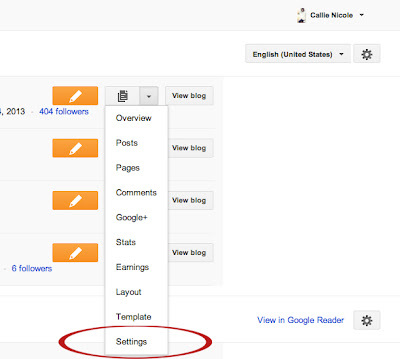 It also does not prevent people from pinning your images, so they will still show up in searches from Pinterest. It's not fool-proof, and some images are likely going to sneak through here and there. But I've noticed a big decrease in the amount of visits I get from image searches, and hardly any come through from pictures of my kids anymore. This gives me a lot of peace of mind about posting pictures of my kids on my public blog. I do, however, still recommend watermarking and using other methods to protect your photos (and again, you can read more about that in the "Protecting Your Pictures" post I wrote). 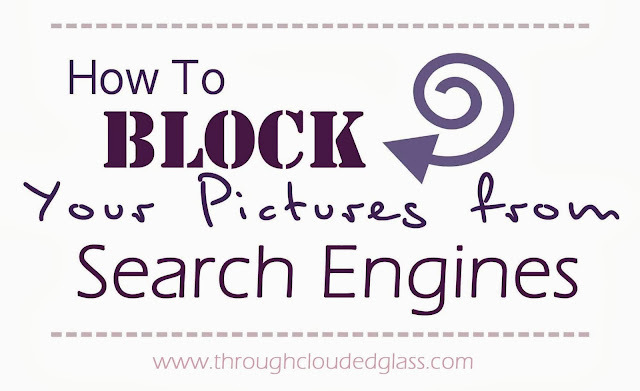 You can read more about how to block specific images from searches here. Any other tips for protecting pictures that I haven't covered? I always like to hear how you protect your images, or whether that's even important to you! Wyatt is growing so big! Even just editing the pictures for this post I realized how much he has changed from even a couple months ago. And he does so many cute things right now - I love this age! I must document. Also please note that these pictures are not all current, just random ones from the last few months. Plus Mr. Wyatt is getting really tricky to photograph, because he barely holds still for me anymore. Also, I realized that I have been a horrible picture slacker this month! I need to take more of my kiddos! Okay. On to the cute Wyatt-isms. Like my word I made up? It means, "all the cute things Wyatt does". There you go. The other week I came to pick Wyatt up from his classroom after church. I told him we needed to go and to put the truck away. He did, and then he turned around, waved to all the other kids in the class, and said "Bye!" A few of them waved back, and then he turned to his little buddy and said "Bye, Jaden!" It was the cutest thing ever, and I love seeing his social skills develop. Sometimes he'll come up to me and ask me for a cracker (or whatever). I'll usually say something along the lines of "You want a cracker? ", then Wyatt says "Hmm, cracker? Okay." Like it was my idea and not his! Whenever we get ready for bed we read a story, and then we pray. Lately he's been repeating different lines after me while I"m praying, which I love. Then we sing a song, and Wyatt is constantly surprising me with how many words he knows! He sang practically all of "Jesus Loves Me" by himself, and then most of the words to "Trust and Obey". And of course he knows all his Donut Man songs. He is a very musically inclined kiddo. He also went through a phase were he would ask for fill-in-the-blank song. He's asked for the car song, deer song, key song, flower song, etc. I think he was just stalling or trying to fool me, but it was cute! Derek and I actually came up with a couple songs that mentioned said items. The deer song ("As The Deer") was his favorite for about a month, and he knows all the words now. I still can't think of a key song though! Whenever I lay him down in his bed at night, he says "I'm gonna scoot up here", and then he scoots to the top of the bed. He knows exactly where he likes to sleep. We went to a baby shower a few weeks ago, and they gave Wyatt one of the balloons to take home. Wyatt loves balloons and whenever he has one he carts it all over the house with him all day long. I have to pry it out of his fingers for bedtime, and the only way he's okay with it is if I tell him the balloon has to "sleep" in my room. So every nap time and night we put the balloon "to bed", and Wyatt shouts, "Night, Night, Balloon! Goodnight!" from his room. My mom came over the day after the shower and Wyatt was carrying the balloon and his blankie with him. She was holding Wyatt and as they passed through a doorway the balloon caught on the wood and popped. After the initial shock of losing his balloon, Wyatt stroked his blankie and said "It's alright, Blankie. You're okay. I'm sorry it hurt you Blankie. It's okay." It was so sweet to see him comforting his blanket! Blankie goes with him everywhere, and Wyatt always feeds him, or puts him to bed, or does for his blankie whatever I normally do for him. Tonight he gave his big blanket to his blankie so it could sleep with it. He tucked Blankie in, and then he grabbed a different blanket for himself. I even caught him one day talking to his blanket saying "I la loo. I la loo, Blankie" (translated: I love you, I love you Blankie). It's so cute I can't even stand it! I love it. As I write this I hear Wyatt and Gwen giggling. I looked over and Wyatt is holding the front of Gwen's shirt and rocking her back and forth. She's laughing hysterically and swaying to get him to do it again, and he keeps laughing and saying "Is that funny Gwen?" Oh my. Earlier this summer we went to the zoo with my friend Danae. It's the first time we've been since Wyatt has been walking, and he loved it, especially the bird exhibits! There was one exhibit where the bird was sitting really close to the barrier, and Wyatt ran over to the stroller, grabbed one of his animal crackers, and ran back to the bird. He held out the cracker and said "Here ya go, Bird. You want a cracker? Here ya go." It was so sweet. I took a trip to Ikea with the kids a couple weeks ago. If you've ever been in Ikea, you know it's like a maze in there. And of course right in the middle of the huge "maze", Wyatt decided to throw a fit. No, my child is not immune. I usually take him to the bathroom for discipline when this happens in the middle of a store, but it was Ikea - I had no idea where the bathrooms were, except for the ones at the very end of the store! So I just dealt with it the best I could and made my way out as quickly as possible, and once we got to the car I corrected him. Then I told him he couldn't have any pretzels because he wasn't good in the store. As we were driving away, Wyatt probably asked 3 or 4 times if he could have a pretzel, and I kept reminding him that he couldn't because he didn't behave in Ikea. Finally he got a really thoughtful look on his face and said "Mama, I'm sorry. I'm sorry, Mama." It was the first time he has ever apologized without my prompting him, and it melted my heart! He still didn't get any pretzels, but it made me feel good that he understood. He's getting it. We went to Derek's mom's house for dinner last week. After dinner Wyatt walked up to me and nuzzled his nose against my arm. Then a second later he rubbed his nose against my sleeve again. I asked him what he was doing and he said "I'm wiping my nose." Gee, thanks Pal! It made me laugh! Every time he hears Gwen fussing after her she wakes up from her naps, he comes over to me and tells me "Gwen's cryin'". I'm usually finishing up whatever I'm doing or making her a bottle, but if I don't get her quick enough for him he says, "I'm gonna get Gwen," and rushes off to her room. As soon as she sees him she usually cries harder, but I think it's sweet that he's so concerned for his sister. He has figured out how to open pretty much every door in the house now. He's usually up before I am in the mornings (especially since Gwen's sleep has been so rough lately), so he'll usually run into my room and say "Morning, Mama!" My favorite alarm clock, for sure! I love my boy, and I can't believe that he's on the downhill slope to 3 years old. Time, slow down. I have to say, I'm enjoying being a part of the Tommy Mommy program with Thomas Nelson! Free children's resources are always fun. One of the books that Thomas Nelson sent me this month is called "God Bless You and Good Night" by Hannah C. Hall. This book is really cute! It's a perfect bedtime book. The words all rhyme, and each page is sweetly illustrated with cute little animals. The illustrations are really nicely done, and it's fun to tell kids what each of the animals is doing as part of the bedtime routine. It takes kids through all the steps of a bedtime routine, including snack, bath time, pajamas, reading a story, bedtime hugs, bedtime prayer, lullaby, I-love-you's, and tucking in. Which is pretty much the exact routine we do with our kiddos, so I loved it! I think it's perfect to wind kids down, especially if you have a similar routine, because you can tell them "See, we did all that - now it's time for bed!" It works well. Thomas Nelson is kind enough to provide a copy of "God Bless You and Good Night" to one of my readers! Enter using the Rafflecopter form below! I'm making it super easy this time and the main entry is just to fill out my reader survey, which you can find here. Unfortunately the giveaway is only open to US residents, but even if you don't live here, please still go fill out the survey! I want to hear from you too! Note: I received this book for free from Thomas Nelson Publishers in exchange for this review. This is my honest opinion. I think all of us have at some point received unsolicited advice. It kind of goes along with being a person. Most people love to give their advice on anything and everything, sometimes whether it is asked for or not. This is true for all life stages, I think, but it reaches a whole other level when you become a mom. Suddenly you are a target for people to shoot their advice at and everyone wants to take a shot, from the lady in the grocery store, to the brand-new father who is catering your family reunion, to the single girl who isn't anywhere near being a mother (not that I speak from personal experience or anything). I've heard from a lot of people who hate getting advice from others when they weren't asking for it - and truth be told, I've had my moments where I have hated it too. But over the years I've learned a few things, and the unsolicited advice doesn't bother me as much anymore. Here are the reasons why. 1. I realize people care about me and are just trying to help. Sometimes I decide to talk about a problem or a struggle with someone just because I want to talk about it. And when they start to try to "fix" my problem by giving me advice, there can be that temptation to feel annoyed. But most of the time they are doing this because they hate to see me struggling, and they want to help my sorrows disappear. So they give advice. When you realize they aren't trying to boss you around, they are just trying to help you, it becomes easier to take the advice for the good intent behind it, even if it's not what you were looking for. 2. I realize people are trying to connect with me. Sometimes people will offer advice because they have been through something similar, and they feel a connection to me. They want to talk about our shared problems or experiences, and sometimes the easiest opening to make that connection or let me know they know what I am going through is to offer a snippet of advice! When this happens, take the bait. Carry through with the conversation and make the connection. 3. I realize people are trying to impress me. Sometimes people give advice because they are trying to show off their vast knowledge on the subject. This usually happens with acquaintances or new friends and is one of the most annoying kinds of advice to deal with. However, I try to look at it from the other angle - they wouldn't feel the need to "show off" if they didn't think I was someone worth impressing. That's kind of flattering! The best way to deal with this motivation for advice is to say something along the lines of "Wow, that's a really good point, is that what you do/did?" or "Interesting, tell me more", and try to take the conversation more in the direction of personal stories. Then you can share experiences and advice back and forth without feeling like you are being lectured. 4. I realize people aren't necessarily trying to be a know-it-all. At the same time, I don't assume every time someone tries to give me advice they are trying to show off. That can lead to unnecessary annoyance. The motives behind the advice are more likely one of the first two. I always assume it's one of the first two motives listed here until it becomes obvious that it's motive #3. 5. I realize that any random advice given by strangers who tell me that some insignificant thing that I am doing is wrong is immediately up for dismissal, unless there is imminent danger or something. Strange people you see in the mall really shouldn't be telling you what to do, unless it's along the lines of "You are blessed, enjoy your life!" (which is probably the most common stranger advice, especially when they see your cute babies). When Wyatt was a month or two old some lady at Joann's told me I was holding him wrong. But actually Wyatt was just trying to look at the lights (he's always loved lights). Annoying? Yes, this is probably the type of advice that is truly annoying with no real redeeming factors. But it's not something to dwell on. Your blood pressure will thank you if you just learn to dismiss it. 6. I realize I don't have to take all the advice given to me. People can give me all the advice they want, but in the end I pray about it, and I decide what's going to work best for me or my family. I'm not obligated to take any specific advice, especially the advice given by random people at the store. And those who love me are going to support me whatever I decide. That knowledge is freeing and makes the advice less frustrating. I've learned to listen to the advice, to consider it because a multitude of counselors is a good thing, and to have confidence in the final decisions I make. 7. I realize sometimes that "annoying advice" is just what I need. This goes back to the week we got back from our honeymoon. Someone who is close to me noticed that I kept correcting parts of the story when Derek was telling about the different things we saw on our trip, and they advised me not to do that and just let Derek tell the story his way. It annoyed me at the time, but two years later I read something that reminded me of that conversation, and I realized that person was right. It was silly of me to keep correcting Derek on things that didn't matter - it was disrespectful and sent the message that Derek was getting everything wrong. I vowed right then to listen to the advice that was given me in the future and try not to be immediately annoyed, because even if I disagreed at the moment the wisdom could become more apparent to me later. 8. I realize that sometimes people are trying to be controlling or manipulative, and in those instances it's okay to respectfully disagree or disregard their "advice". Some people are controlling. Some people are trying to push their agendas. Some people are insulting you personally and hide their insults behind "advice". I try to give people the benefit of a doubt, but I think if you suspect that this may be the reason behind someone's "advice", you should run their comments by someone you trust. If you feel like someone is being controlling or manipulative, it's okay to respectfully stand your ground and refuse to accept the hurtful words. How did I come to realize all this? Because I've come face-to-face with the fact that sometimes I am an unsolicited-advice giver! I think everyone is at times without really realizing it. And I know the reasons behind my motivations when I give advice. This has helped me to search out and appreciate more the heart of those who are trying to give me advice - because I think most people are giving advice for pure reasons. And you know what? I love that. I love that they are interested enough in me and care enough about me as a person to want to help me. I love that they want to connect with me and impress me. I love that I have people in my life who are willing to say the hard stuff because they want me to be "the best me I can be". 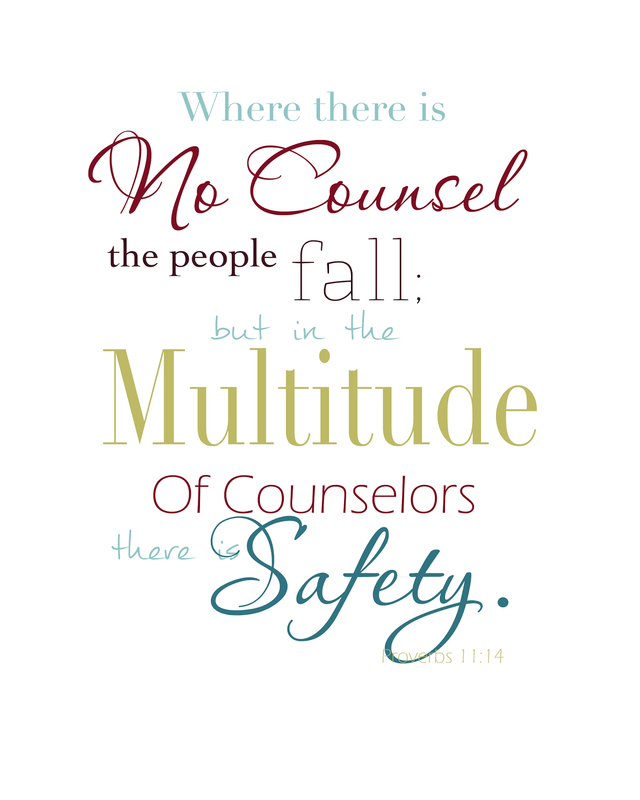 I've learned when advice is just a different way of looking at things, when someone's advice is something serious that I should prayerfully consider, and when it serves no other purpose but to control or hurt. When I can distinguish that I can react in the appropriate way. What are some ways you deal with unsolicited advice? Are there any things that have helped you have a more God-honoring perspective when it comes to all the advice-giving? I'm excited to have the opportunity to review a couple more books from Thomas Nelson this month! One of the ones I received was a children's book called "Everybody Can Help Somebody" by Ron Hall and Denver Moore, which apparently is the kids version of a book called "Same Kind Of Different As Me". I can't speak for "Same Kind Of DIfferent As Me", because I haven't read it, but based on the kid's book I'm assuming it must be some sort of biography. If any of you have read that, please fill me in! So "Everybody Can Help Somebody" was a nice book. It's actually a biography of the life of a man named Denver Moore, but it's adapted for kids. The book tells the story of Denver's life, first as a sharecropper when he was young, and then as a homeless man as he travels to the big city. It tells of different people who helped him, but especially a lady named Debbie who told him about the love of God. This book doesn't speak about Jesus at all, but I think it does encourage kids to think about how God loves people and to tell people that. It also had a good lesson as far as how just helping someone when they need it can change their life. It was an alright book - as a Christian mom, I definitely want my kids to learn to tell people about Jesus though. It's true that God loves people, but that is only the beginning of the story, and people can mean a lot of things when they just say that by itself. John 3:16 says God loved the world and because of that He sent Jesus, so that if we believe in Him we will be saved. Believing in God and God's love doesn't mean anything without following it up with Jesus. He's the bottom line. And unfortunately this book doesn't say a word about Jesus, so I felt it was too vague and ambiguous. I don't even know what the author thinks about Jesus. Which is okay if it's just a regular kids' book, but since this is a biography/testimony type book that talks about God's love, and from a Christian publisher, it kind of bothered me. So that's one thing I wasn't crazy about. But I think it could be a good tool for telling kids about showing love to "the least of these". And if you're child already knows Jesus as his or her Savior, then I think this book is fine. But if you are still teaching them about Jesus, I say make sure they have a good foundation first and save this book for later. Wyatt has officially dubbed this the "train book" - which cracks me up because there is only one small line about a train, and one page with a picture of the train! But he loves to turn to that page and look. It's cute. I clearly need to get him more books about trains. So I'm starting a little mini series on the blog today! I wouldn't necessarily call myself a blogging expert. But I have been doing this for a long time. And I've been designing for myself since the very start. So I know how to do certain things, and it occurred to me that I should share my knowledge with all of you - hence this series. First just let me say that this is going to be a very unstructured series. I'm not going to post on any specific day or at any specific intervals, just when I feel like it. And when I say the tips will be random, I mean they will be random. There's no rhyme or reason here. I might do tutorials on how to do something in Photoshop Elements or in the template designer. I might share links that explain how to do certain things better than I can. I might share blogging resources that I think are useful. It's pretty much anything I feel like, and hopefully some of it will be helpful. So first things first - let's start with my header. See the pretty gradient font? I'm going to tell you how to create gradient text (and shapes) in Photoshop Elements. First let me just say that I learned how to do it by watching this video - and if you have any issues figuring it out from this tutorial, I say watch it, and hopefully it will answer some of your questions. But for those of you who don't want to stream a video, I'm going to explain it here. Find colors that you like together and write down the numbers. Once you have the color scheme you like, you want to create a gradient. (1) Open the gradient tool, (2) select a gradient style that you like, and (3) click "edit". Then when the gradient edit box opens, see those little colors sliders? (1) Click on one, then (2) double-click on the color and type in the color code for the color you want in the color code box (see first image in this post). Do that for each slider and slide the color stops until the gradient looks the way you want it to. Then click "save" and name your gradient something you will remember. It should show up in the gradient drop down menu now. Now go to "File" and click on "New", then "Blank File". Size this file so it will be wide enough to be your blog header (I made mine 1250 pixels). Create a text box and type in the words you want to use. Make sure the text is black. While you're at it, get it centered the way you want. Now create a new layer either by clicking on "Layer", "New, and "New Layer", or you can press Shift - CTRL (or COMMAND) - N.
Click on the gradient tool and drag the gradient line from one side of the blank file to the other. I usually do mine corner to corner, but you can do straight across or whatever. The gradient will be covering your text because the gradient layer is above your text. This is the way you want it. Now go down to your layer box in the lower right-hand corner. Put your cursor between the text layer and the gradient layer. THen hold down the ALT button (or the Option button on a Mac), and when you move your cursor between the text layer and gradient layer a little weird cirle symbol will appear. When it appears just click . . .
And wholla! The two layers connect and you have gradient text. And finally, if you select both the gradient layer and the text layer and then go to "Layer" and click "Merge Layers", you can make your text or shape movable! Now you can decorate it any way you want! You can also do this with shapes the same way as long as you start with the shapes being black. Then merge the layers just like I explained above to move the shape around. I checked out PicMonkey and googled, and there really isn't a good free alternative to create gradient text, at least not that I could find. This is the best one I found, but you can only use their pre-set colors, which isn't ideal if you are wanting to make something for your blog design. I will let you know if I come across something better. And if I can just put in my two cents - if you want to do your own blog designs or if you are into photography at all - I'd recommend Photoshop Elements. It really isn't outrageously expensive - about $80-100, and I hear with a little work you can do almost anything with PSE that you can do with the full Photoshop (which is hundreds of dollars). It's definitely the best resource for blog design that I've used - you can do some stuff with PicMonkey, but you are definitely limited. Photoshop Elements has been worth the money to me. Photoshop isn't paying me to say that, I'm just an Elements fan! That's it! Let me know if you have any questions and I'l try to help! I just figured out how to create a Google Docs survey! I know, it's about time, right? I know I've done these types of reader surveys in the past, but readership is constantly growing and changing. And that's exciting! I'd really like to just get a general idea of who is reading my blog. If you don't mind, could you fill out the survey below? I'd also really like to hear from you if you're a "silent" reader - meaning if you don't follow me publicly, please still tell me about yourself! Thank you! Hint: This may also count for extra entries in various upcoming giveaways, so there's a little extra incentive! We officially started a preschool program for Wyatt at home last week! I feel weird saying "Preschool" (1) because 2 1/2 years old still seems so little for preschool, and (2) 2 1/2 is little for preschool. I think preschool at two years old is more about practicing school - practicing doing a "school" activity each day, learning more about every day things, learning through play, just basically getting "practice" for future years of serious learning. Learning readiness and all that. And my goodness, all that is super-easy to do at home! In fact, kids probably do more early-learning at home than in a group preschool setting, in my opinion. Less distractions and more one-on-one attention at home. So yes, we started "practice preschool", as I'm calling it this year. I found out about this really cute God-centered preschool program called God's Little Explorers, which you can find here. You can buy an e-version of the whole program at once for $14, or you can access each lesson on her blog for free! And free is a price I like, especially for a two year old preschool program. I love this curriculum because each week is focused on learning a letter which is tied to a Bible story, so Wyatt will be focusing on God's Word at the same time as the letters. She gives a ton of ideas for different activities to incorporate the lessons for each week, more than we could ever actually do. I'm cherry-picking the ones that I have all the supplies to do, and the ones that Wyatt would actually enjoy doing (because I just know some of the activities are not things that he'd be into yet). I think if we decide to incorporate this program next year it would still feel new because there are so many additional activities we could do together, and it's one of those programs that you could add to pretty easily. Last week was just an introductory week - no specific Bible story, just generally getting ready to eXplore God's Word. So the letter was "X". I taped a bunch of "x's" around the house and went on a treasure hunt with Wyatt (hiding some of his new crayons and stuff under the x's). The rest of the week he loved pointing out all the x's. We also got the sound that an x makes down pat. I also like it because she adds other things to work on learning each week besides just letters, so if he picks up a letter pretty quick (like last week), there are other things to do. Overall, I think this year is going to be fun! We're not going to get too uptight about it, because let's face it, he's two, and this is supposed to be fun for him. But it amazes me how much he soaks up and how quickly he learns new things. I think he's going to learn a lot, and I'm looking forward to getting the practice on planning things for us to do for school during the week! This week is about the Creation story and the Garden - the letter G. I'm off to cut out some "G's" out of construction paper now. . .
P.S. Also making sure to take some time out today to remember 9/11 and to pray for our country. We won't ever forget. Lately I've been having a difficult time blogging. Honestly I know it's just a dry spell - this happens to me probably once a year, so it's not unusual (I'm not going to quit blogging!). I've just been feeling a bit discouraged and uninspired. And then on the weekend I discovered that one of my pages (that was bringing me a significant amount of search traffic) seems to have been penalized by Google's algorithm. 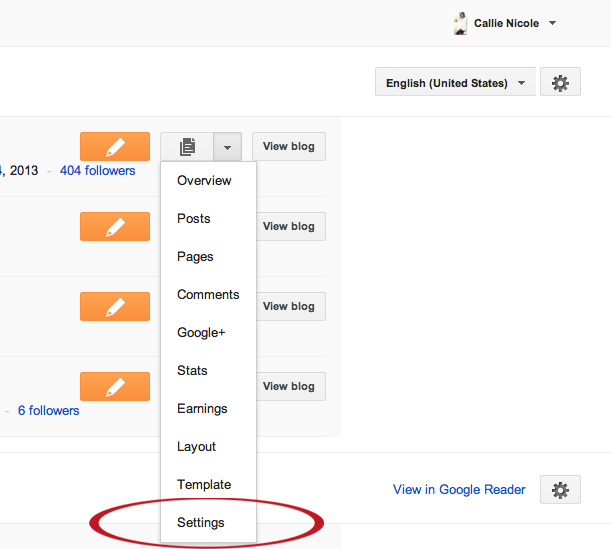 Meaning, my page rank for that specific post is lower, and it's no longer showing up in searches! This was a big deal to me, because like I said, I got quite a bit of traffic from just that one post. After frantically searching the internet for possibly causes for the penalty I made sure that my page was squeaky clean and then I went through and emailed the owners of some spammy websites asking them to take down their links to my site (spammy links can hurt you with Google). But I was feeling pretty discouraged and overwhelmed. It's as if all my hard work for that traffic was just erased. Practically speaking, I can't get every single unnatural link taken down from these bogus websites - maybe if I had a full time staff for the blog, but it's just me. So after staying up until 2:00 AM on Sunday trying to figure this out I wasn't even sure if any of that work was going to fix the problem, since I can't be positive what it was that caused me to get a penalty. I still dragged myself out of bed for church though, and as I was sitting there in the aisle listening to the music I felt like the Lord reminded me of something. Why am I blogging anyway? I have always wanted this blog to first be a place to share with others what the Lord is teaching me, as well as a place to just record everyday life stuff that my kids might like to read someday. It's easy to lose sight of that purpose when I'm staring at visits and pageviews and backlinks, when the focus of blogging as a whole seems to have shifted to product reviews and paid posts and blog sponsors. And is it nice to get a product for review or a little extra spending money? Sure. Is it nice to have your post show up on the first page of Google and get lots of extra visitors per month? Yeah, it is. But is that really why I'm blogging? No. Honestly, my biggest hope for this blog is that it will point others to Jesus and ultimately bring glory to Him. I forgot one of the reasons I enabled search engines to find my blog in the first place - I wanted to open it up to searches hoping that more people would find their way here and see something about Jesus that would get them thinking. The Lord knows that, even when I forget it. If He feels like the right people, the people who are supposed to find my blog will find it without that post showing up high in search results, then maybe it has served it's purpose and it's time for me to move on. He'll still make sure the right people find me. He doesn't need Google. I think I might just have forgotten that this blog is not supposed to be a place to bring glory to me. And if I'm honest, that's part of the reason I was upset about that post being penalized, because I felt sorry that my good idea wouldn't be front and center anymore. This blog is not supposed to only be something that will make me money or boost my own self esteem. It's not even all about the blogging community (as much as I love you guys!). If that's all I'm doing here, if those things become my focus, I'm going to get discouraged, Google penalties would be the end of the world, I'm going to compare myself too much to other blogs, and I'm going to get burned out. This blog is supposed to be a place to bring glory to God. And the Lord knew it might take a little ding from Google to remind me of that. Barefoot Books - Review and Giveaway!